All things considered, 2013's Pacific Rim didn't really need a sequel. Directed with the usual visual flair by Guillermo del Toro, this upgraded tribute to the Japanese Kaiju films of the '60s and '70s is simple but spectacular fun, and also remarkably self-contained. No matter how interesting the universe in which Pacific Rim is set may be, a return visit was not only unexpected (especially considering the film's sizeable but not quite sequel-worthy box office), but without a compelling concept, possibly ill-advised. Still, del Toro promised a sequel, someday. And though the newly minted Oscar winner is not at the helm, almost five years and a major studio change later, "someday" finally comes this weekend with the release of Pacific Rim: Uprising. Set ten years after the end of the Kaiju war (or, the end of the first movie), Uprising follows Jake (John Boyega, Star Wars: The Force Awakens), the ne'er-do-well son of the first film's charismatic (and awesomely named) hero Stacker Pentecost. As punishment for one transgression too many, Jake finds himself helping to teach the next generation of Jaeger (the film's giant, two-piloted robots, for the uninitiated) pilots, including Amara (newcomer Cailee Spaeny), the token plucky young girl with a talent for building her own Jaegers out of foraged scraps of the old ones. All of this is naturally just in time for a new threat to humanity to emerge from the Pacific. Like the first film, Uprising knows exactly what kind of movie it is and may in fact take itself even less seriously than the original. The film also looks great, with cool new Jaegers eight-year-old you will immediate want toy versions of, and collateral damage that may even put the climactic New York battle from The Avengers to shame. Director and co-writer Steven S. DeKnight, a former Joss Whedon protégé previously best known as a showrunner on Netflix's Daredevil series, has an eye for spectacle and an impressive arsenal of situation-appropriate witty banter, which makes Uprising a looser, lighter affair than the first. There are some glaring problems with the film that are difficult to avoid. So many of the secondary characters are uncharismatic and disposable, a change of pace from the original's scenery chewing but not necessarily a welcome one. The film's premise attempts to build off of events and characters set up in the original, but what should be clean and natural progressions are instead clumsy and even in some cases completely inexplicable. There was no reason the film couldn't have just come up with some ridiculous reason to revive the Kaiju without forcing unnecessary expansions of seemingly lesser plot points from the first film. Much of the film feels like it's just creating excuses to make a sequel, rather than simply continuing the storyline. Uprising never lets you forget that it's an unnecessary sequel. 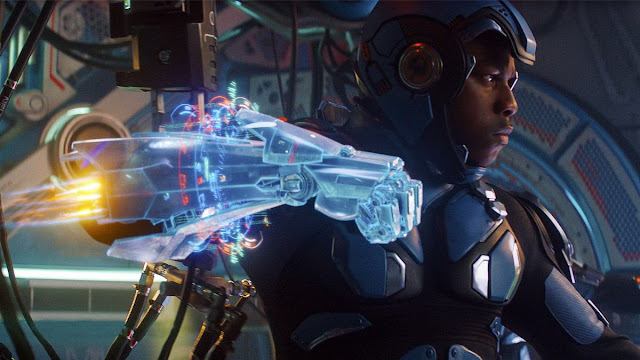 But if one can get past nonsensical plot devices, questionable villains and the vacuum of charisma that is Scott Eastwood, there's a surprising amount of fun to be had with Pacific Rim: Uprising. Boyega is once again a highlight, with a bright future as this particular kind of reluctant action hero, a part he played so well in the Star Wars films and Attack the Block. And the main event we all pay to see, the city-leveling action sequences, are certainly a sight to behold. The film simply looks and sounds phenomenal in a big theater with a huge screen and great sound system. There are plenty of major, some might even say unforgivable, problems with Uprising, and DeKnight is certainly no del Toro. But in its breezy 111 minutes, Pacific Rim: Uprising is a true popcorn flick, delivering on its promise of a big, fun, if slightly empty, time at the movies.